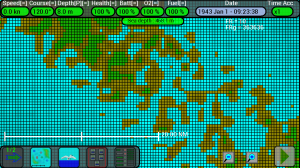 The “terrain” permits to play a game with land masses and zone of ocean with different depths inside the map, to make the game more funny and difficult. 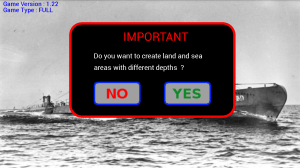 It is available only in the Full version of the game, is generated randomly when a new game is started and you can choose if generate it or not. If you choose NO, the game will be created without terrain, and all the map will have a fixed depth of 1000m. 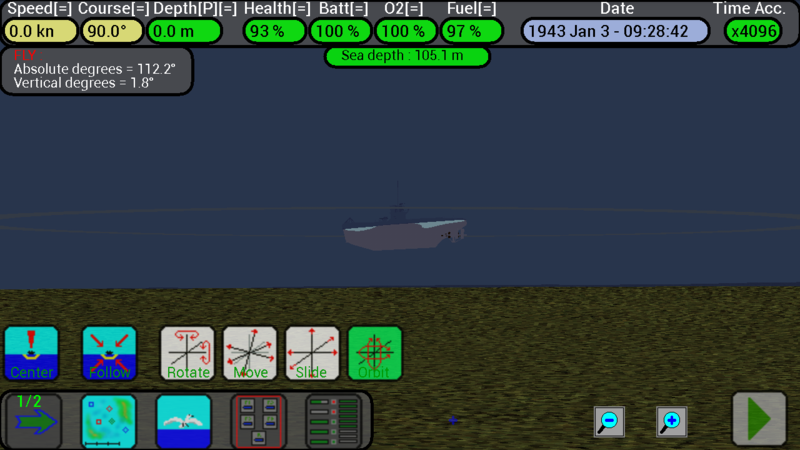 Note: the terrain was introduced in the version V1.21 of the game, no problem if you load a game saved with a previous version, all depths will be converted from 350m to 1000m (below 300m the submarine explodes, so nothing changes). 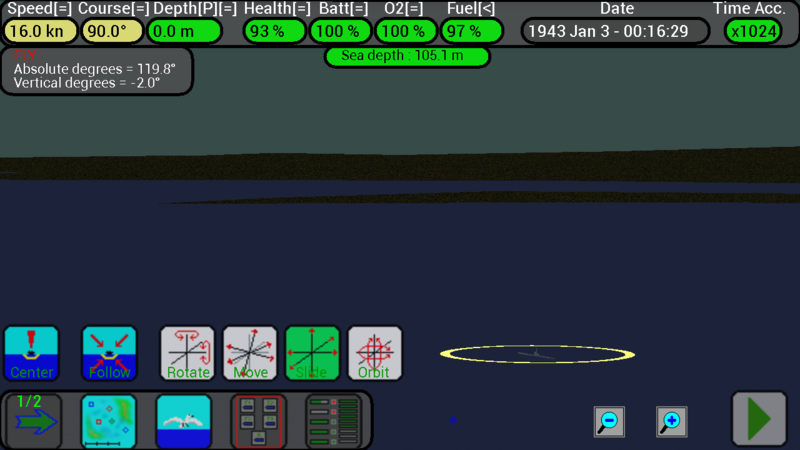 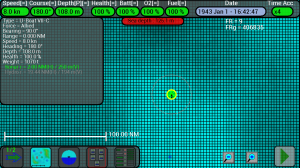 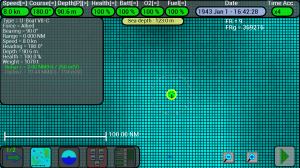 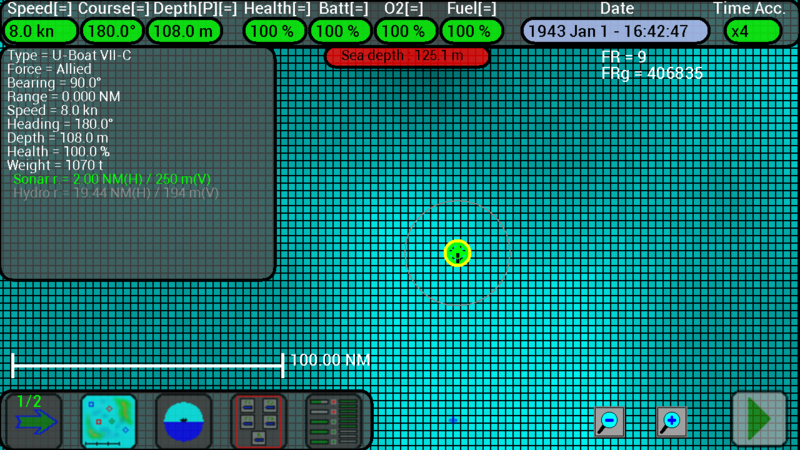 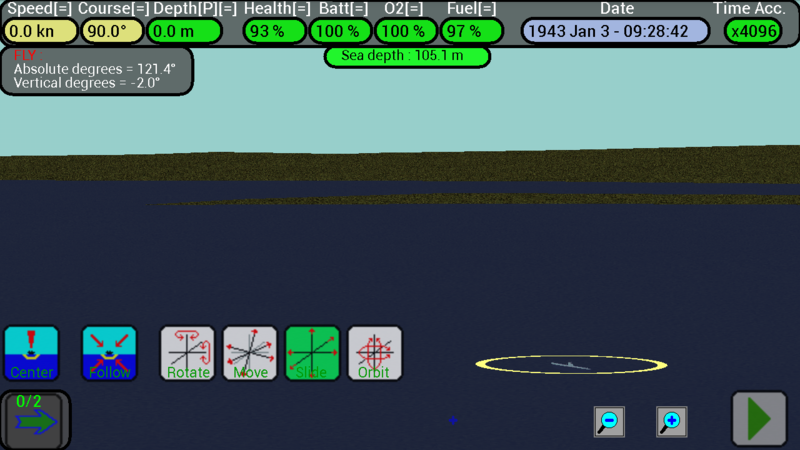 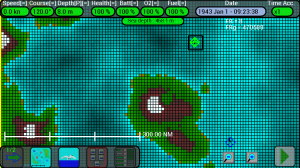 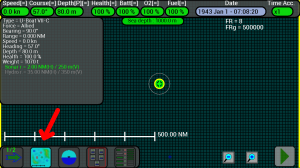 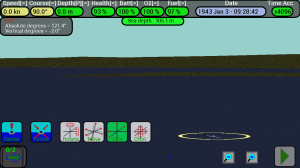 If you choose to not generate the terrain, all the map will have a fixed depth of 1000m, at the top of the screen there is the indication of the sea depth (at the position of your submarine). 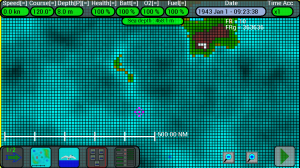 As shown in this image, the color of the map changes during the day (light during day, dark during night). Note the icon of the map button, it indicates that we are in map mode. The map now has a dark color, because it has a big depth (1000m). At the top of the screen the “Date box” will change color if we are during day or night. 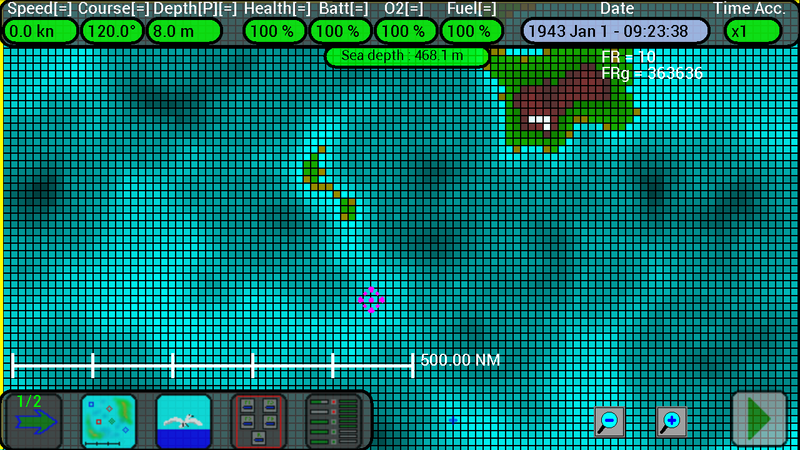 BLUE is sea, dark blue indicates zones with big depth (up to 1000m), light blue indicates zones with low depth (up to 100m or less). 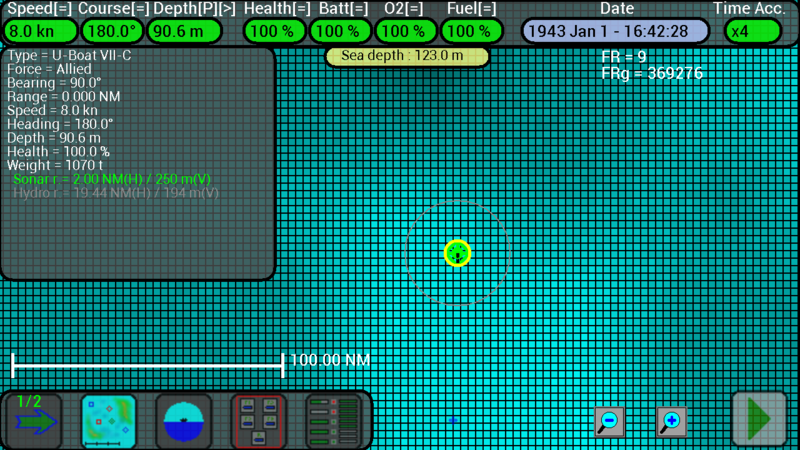 Be careful to not touch the ground with your submarine because it will be damaged, look always at the color of the zone where you are and look always at the indicator of the sea depth in your zone (at the top of the screen). 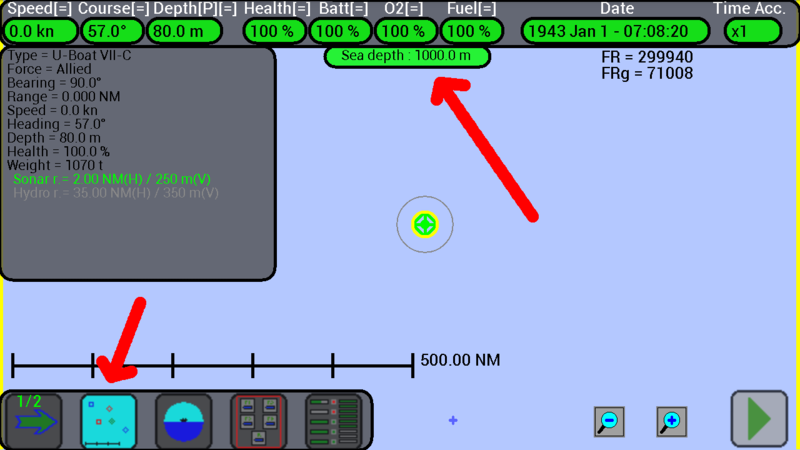 If the indicator shows 100m, your submarine can safety stay at a depth of 94m, don’t go below or it will be damaged (a difference of 10m or more is ok). 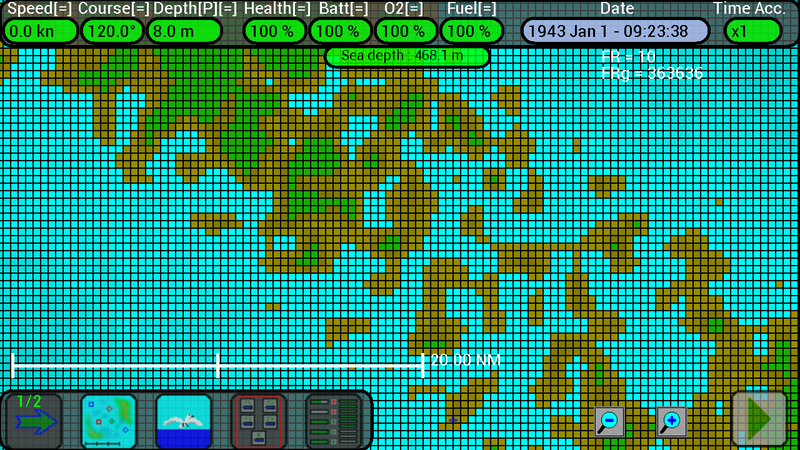 YELLOW/LIGHT BROWN is sand, beach, indicates the border of a land mass, don’t touch it with your submarine. 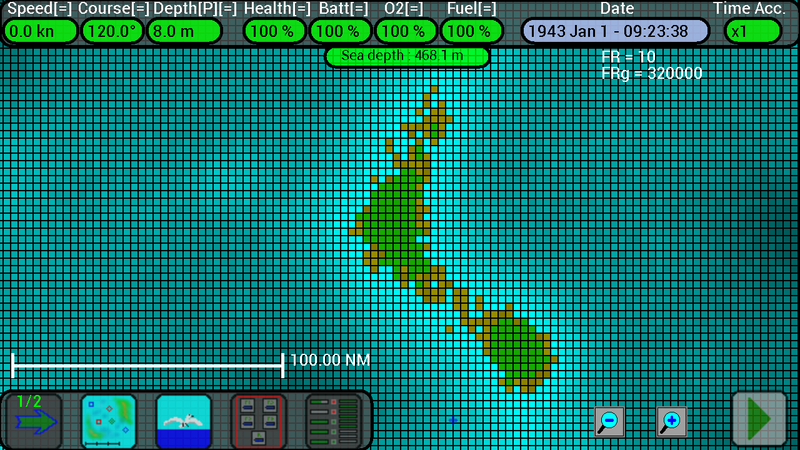 GREEN is land mass with low height, hills. 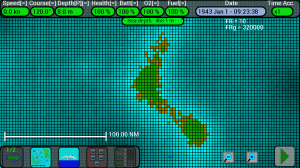 BROWN is land mass with medium height, mountains. 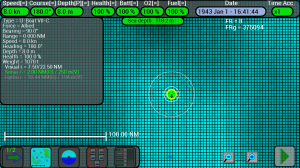 WHITE is snow, high mountains (height up to 1000m). 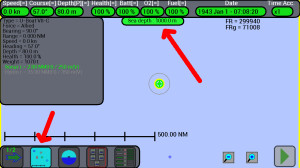 Important: when your submarine is in a zone with low depth (50m, 100m), it could be very difficult to escape and remain undetected from the enemy’s sonar or hydrophones !! 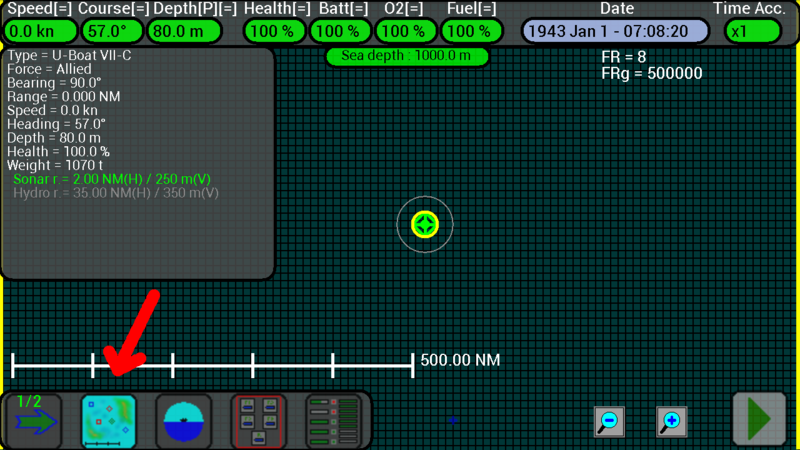 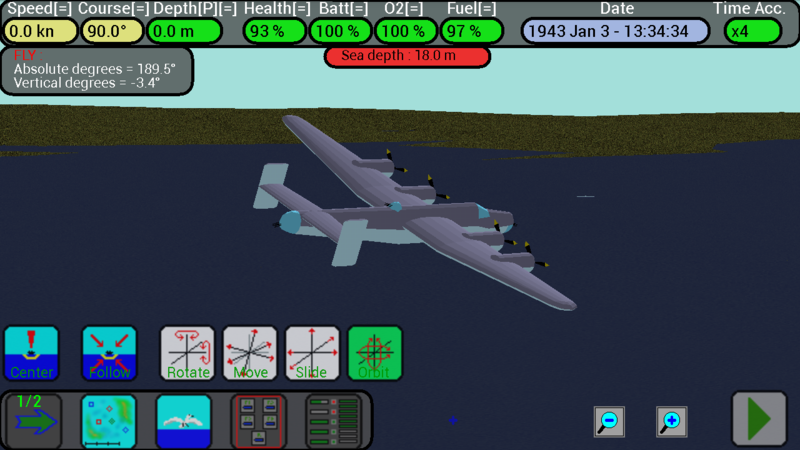 Note: the indicator for the sea depth at the top of the screen will change color if you are near the ground. 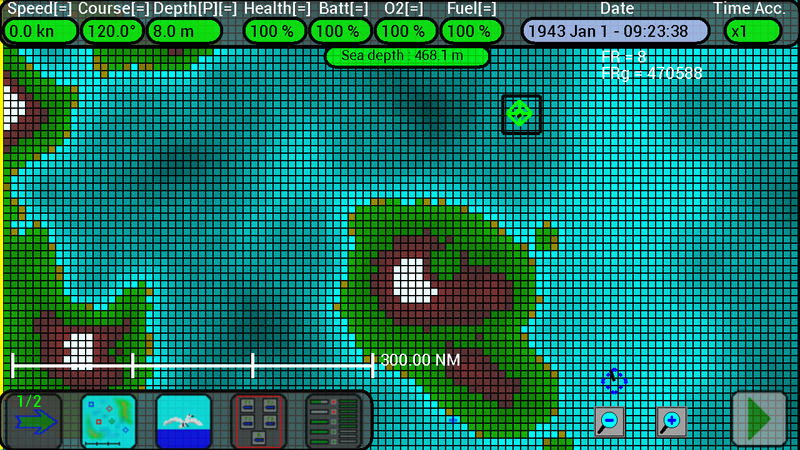 Green is ok, if yellow it is better to check your depth, if RED be careful to not touch the ground !